Anti-cruise-missile technology masterminded by a beautiful defense industry scientist may be critical to maintaining the balance of power as Pakistan and India come closer than usual to war. 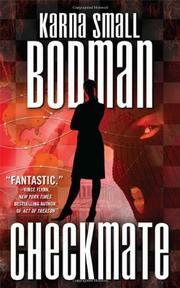 Mixing inside-the-beltway policy with some decorously heavy breathing, debut novelist Bodman, whose post at the National Security Council made her one of the highest ranking women in the Reagan administration, constructs something of a war game around the assumption that it is technically possible to seize the codes that guide a cruise missile while it is in the air. Luscious, brilliant Cameron “Cammy” Talbot is one of the technical wizards at Bandaq Technologies, an ethical defense contractor run by a straight-shooting general. Licking her wounds from a disastrous love affair and haunted by childhood memories of her father’s death, Cammy’s leading the development of Bandaq’s breakthrough anti-missile project. But her stellar work may be in vain. Congress threatens to cut off project funding and shift resources to arch-rival Sterling Industries, a defense contractor that backs old technology as it orchestrates technical and political sabotage against Bandaq. Cammy puts her project in greater peril when she resists the advances of a lecherous but influential congressman. Fortunately for Bandaq and Cammy, evil Kashmiri separatists have stolen three Pakistani cruise missiles in their effort to provoke war between the nuclear powers, and Cammy’s project may be the silver bullet, if pesky algorithms can be straightened out in time and if she can dodge attempts on her life by the separatists. Plagued by nightmares, headaches and carpal tunnel pain, and dodging bullets fired by zealots in Volvos and on Vespas, Cammy hammers away at the codes and wonders if dreamy, jut-jawed, White House staffer Col. Hunt Daniels, who’s taken a protective interest in her, could be The One. Revives memories of Jeanne Fitzpatrick and that wonderful Strategic Defense Initiative.